My Blogger Buzz: How to Add Voice Commenting System in Blogger? How to Add Voice Commenting System in Blogger? Blogger's are generally always looking a great new widget for their blog for decrease their bounce rate and also for attracting huge traffic towards their blogs. Blog commenting is the best way to get reviews of visitors and make our services better for them. There are lot of commenting system for blogger like Disqus, Blogger Default, Google Plus, Facebook, Intense Debate with Commentluv and lot more but in all of them you visitors have to write up that need so much time and irritate your blog readers specially for those readers whom typing speed is not good so that they do not leave any comment on your blog. But whay you say if your visitors can comment on your blog by their voice. Yes, you heard it right a voice speaking commenting system for blog. I bring this brand new and unique widget for your blogger blog. So lets start the tutorial to add Voice commenting system to your blogger blog. How to Add Voice Commenting to Blogger? 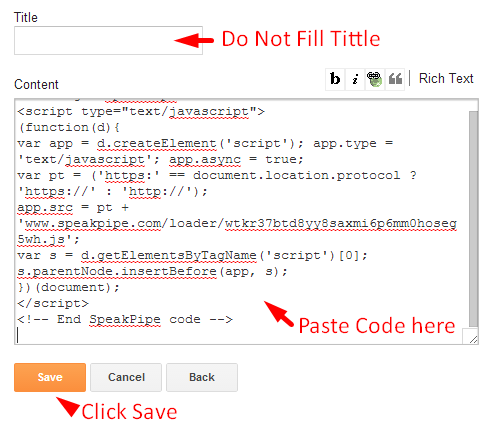 Step 1: Go to Speakpipe.com and Create Account. Step 2: Confirm your Verification Link. Step 6: Go to at the End of the Page. 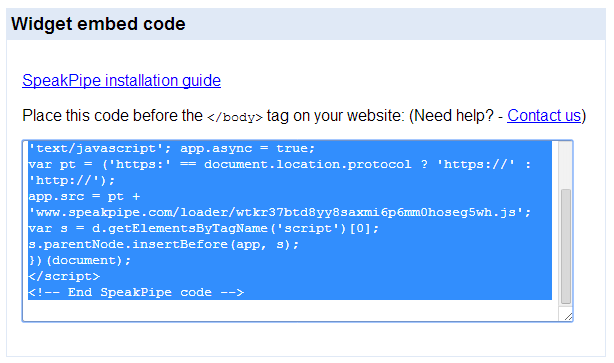 Step 7: Select Codes and Copy them. Step 8: Go to your Blogger Dashboard. Step 11: Paste Copied Code in it and do not Fill the tittle Field of the Widget. So this is just a blasting and unique trick for blogger users. Now you are ready to attract a lot of commenters and traffic on your blog. Now It's your turn to share this post with your friends and write your views in comment box below till then Peace, blessings and Happy Commenting.